DIRECT GULF FRONT UNIT WITH INCREDIBLE VIEWS!!! LUXURY, CARIBBEAN THEMED DECOR, CLOSE TO ALL ACTIVITIES. Roomy, Beautiful, and Vibrant best describes our Gulf Shores, Island Tower condo located in Gulf Shores, Alabama. Every room has been painted in classic Caribbean shades and decorated with fun, yet tasteful decor. You and your family will be amazed by the stunning views from our 22nd floor condo! They literally take your breathe away! 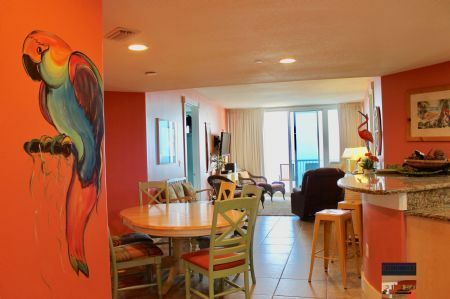 This 1600 square foot condo also features a beautiful collection of art from Gulf Shores artists, a dining room for 6, and a gorgeous fully stocked kitchen with granite counter tops and stainless appliances. Incredible Gulf front unit, complex is close activities in Gulf Shores. Close to Gulf Shores activities. Breath taking view of the Gulf of Mexico, direct Gulf front complex. We had a very nice stay at this condo. The views were spectacular! The condo itself was very well furnished and very comfortable. The beds were some of the best we've had in condos along the Gulf. The only suggestion we have is to install a keypad lock. Getting keys and then returning them upon departure is a bit of a hassle. Thank You for the wonderful review. We look forward to having you as a guest again soon. All units come with a number of bath towels for the number of guests staying. Extra towels can be brought to the property at the guest's request. This condo was even better than expected. We had an amazing stay. My daughters loved the bright decor and beautifully painted murals on the walls. There was plenty of room for the five of us and we could’ve brought friends and still been comfortable. The large balcony was amazing and had plenty of seating. The entire property was very clean. We loved the indoor and outdoor pools and the easy access to the beach. Beachball Properties was great to work with, they were quick to respond anytime we had a question and the check in and out process was very easy. We will definitely stay here again. I have stayed in this unit twice! Not really sure why I am just now leaving a review. Guess I finally got around to doing it. My family and I love staying here because it is within walking distance to almost everything and it has amazing views. Every thing was effortless and seamless, from the booking process to the check out process. I was really impressed by the condo. I thought the view was absolutely fantastic, and as a photographer, it was a really wonderful and relaxing place to photograph the sun as it descended down over the water. The inside of the condo was very clean and stylishly furnished (the fish on the wall easily couldn't have worked, but it did). I would absolutely recommend this condo to anyone who's looking for a comfortable place to stay during their trip to the beach. We enjoyed our stay in your condo this past winter so much that we booked it again for this winter. The condo was very clean, kitchen was well equipped, and it was nicely furnished. We enjoyed the view from the 22 floor and were able to see the dolphins playing in the gulf. The condo is located close to our favorite restaurants and was in walking distance to many attractions. 3 Blocks from the HangOut/Hwy 59! Perfect location for beach activities, free concerts (when held), Shrimp Fest, and more! Walk to Famous Restaurants and Shopping!